Is Your Older Adult Parent Just Aging, Or Suffering From Addiction? Addiction in older adults is a very common disease, and unfortunately, very commonly misdiagnosed. Sometimes called the “invisible epidemic”, substance abuse issues in older people can often mirror signs of aging, making it even more difficult to distinguish and treat. It’s true that addiction has no age limit, but neither does recovery. It’s never too late for someone to seek help for their addiction and begin a new, clean and sober life. This is where Caron Treatment Centers Inpatient Addiction Rehab for Older Adults, which specializes in care for individuals over 65 years of age, comes into play. At Caron, treatment professionals are able to assess and determine whether or not an addiction exists within an older adult, and if so, recommend the proper treatment plan for the identified addiction. If you suspect your parent might be dealing with substance abuse issues, here’s what to remember and how specialized treatment can help. Be aware of the signs and symptoms. As a parent ages, changes in behavior, mood and physical mobility will occur, making symptoms of addiction even more difficult to track. Slurred speech or forgetfulness can be symptoms of aging, dementia, or, they could be signs of alcoholism. Use of prescription drugs, specifically tranquilizers like Benzodiazepines, which are regularly prescribed to older adults, can become dangerous if not properly managed. Some signs to look out for include solitary or secret drinking, self-prescribing for chronic pain that’s not supported by a medical doctor, hostility, depression and confusion. Together, these signs are good indicators that your loved one may be suffering from addiction. Approach your loved one with the respect and dignity they deserve. A recent report shows that by 2020, the number of older adults battling substance abuse issues is projected to double. Older adult addicts, who could be unaware that their use of pain medication has turned to misuse, for example, should be treated with respect, care and dignity when approached. At Caron, licensed psychologists, psychiatrists, medical doctors and addiction specialists are on hand to help provide therapy, care and counsel for behavioral and emotional issues that are often at the root of an addiction. A patient’s health status will be determined early on in the rehabilitation process, at which point doctors and specialists will build a comprehensive, individualized treatment plan for your loved one based on their addiction, as well as any co-occurring disorders and chronic pain they may be experiencing. A multi-faceted, all-encompassing approach to your loved one’s health and well-being is one of the most important things to consider when deciding on a treatment facility. As an adult child, you may feel lost, alone, or unsure of how to broach the topic of substance abuse with your parent. Addiction at its core affects the entire family, friends and those close to the addict just as much as it affects the addict. With older adults, it’s important to make recovery a family affair. The Inpatient Addiction Rehab for Older Adults program takes special care to educate family members about the treatment process and how they, too, can seek help. With older adult addicts, it’s important that the children, significant other, and even grandchildren are getting the help and support they need. The staff takes time to speak with family members each week during treatment, updating them on their loved one’s status while also checking on the wellbeing of the family. If you are struggling with understanding your loved one’s addiction, the experts at Caron Treatment Centers may offer referrals for therapy, support groups or other programs that can help you cope during this journey. You might be scared, frustrated, angry, unsure, skeptical, hopeful or, maybe hopeless. The truth is, feelings of fear, anger frustration and hope are valid during such a difficult time. As important as it is for your loved one to want help, you, too, should not be afraid to reach out. Expert licensed therapists encourage loved ones to participate in family therapy sessions, where topics like family dynamics, healthy boundaries, enabling behavior and an introduction to recovery as the 12 Step Program are discussed. “There is a lot of healing from that process,” says Sharon Matthew, Clinical Director of the Older Adult Program. 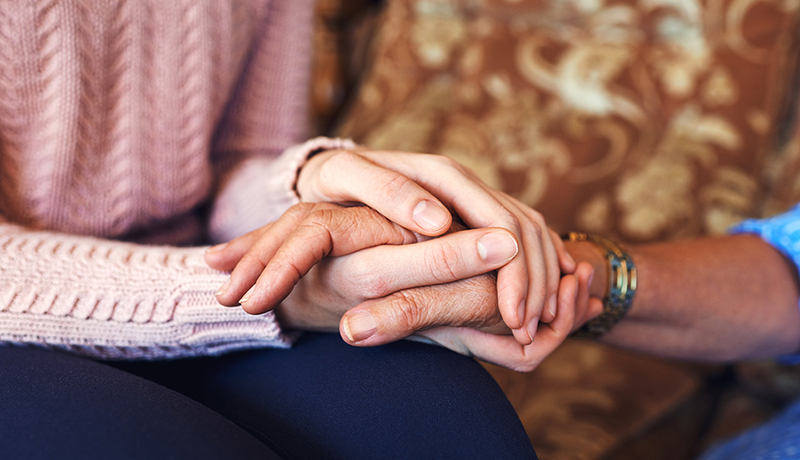 According to Matthew, who has worked at Caron Treatment Centers for over 21 years and served as part of the developing team of the Older Adult Program, this type of family communication — expressing one’s fears and feelings and how they relate to their loved one — is very effective and well-received. Getting your older adult parent or loved one the help they need is the first, and sometimes the hardest, step in conquering their painful addiction. As Matthew says, while it’s never too late in life to develop an addiction, it’s also never too late to get sober. “I truly believe that in my heart,” she says. Her decades of working experience is proof of that. If you suspect your parent is struggling with drug use or addiction, don’t wait until it’s too late. For more information on taking the next steps toward recovery, visit Caron Treatment Centers.